Nestled in a corner, this space-saving design is shown here in mist gray maintenance-free siding. It's a perfect solution for housing pool equipment as well as providing winter storage for patio furniture. Twin side-lite windows and a French door provide plenty of natural light. 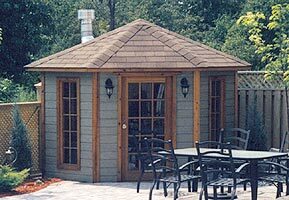 This unit configured as shown, with mist gray siding, is currently listed in our bargains section. Check it out and get a great deal! 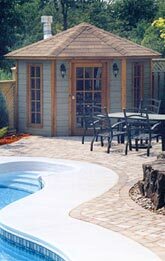 An 8' five-sided pool cabana clad in mist gray maintenance-free Canexel siding. Use this design center to price and/or customize this pool cabana design. Use the different sizes shown below as a starting point.